A woman from the Acoma Pueblo of New Mexico made this olla, or water jar, to carry water from the well back to her home. Historically, Puebloan women carried ollas such as this balanced atop their heads. 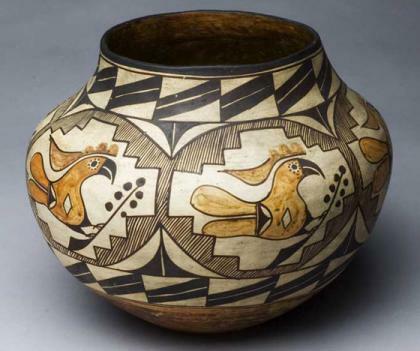 The thick-billed parrot on this pot is a symbol unique to Acoma pottery. The Acoma people associate brightly-colored parrots with rainbows, and thus with rain. Some also see parrots as spirit messengers who bring sun and rain to the dry Pueblo. Dancers use parrot feathers on their outfits during ceremonies, especially those requesting rain and healthy crops. It makes sense, then, that artists would also paint parrots on water jars.